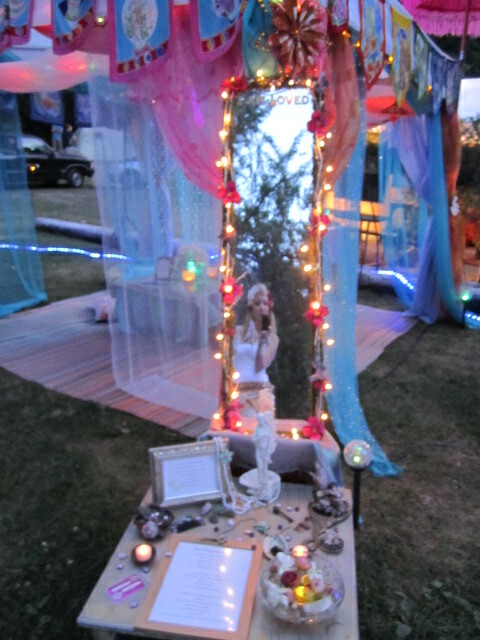 By far one of our favorite past times is creating altars. There is just something about the energy that transmits through us as we are working on one. 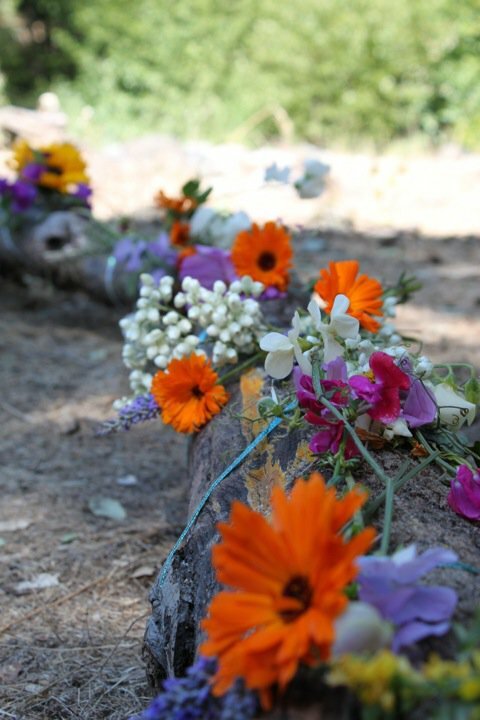 When we build an altar, we feel a very deep connection to spirit. It’s the type of feeling where you know you are in a state of 100% authenticity and united with the divine. It’s a very humbling feeling of being in gratitude. It’s hard to explain the process, as we don’t really have a step-by-step approach to it. Once we begin the process of creation it really takes on its own form. Anne and I are just conduits moving the energy so that spirit can manifest into a physical form. 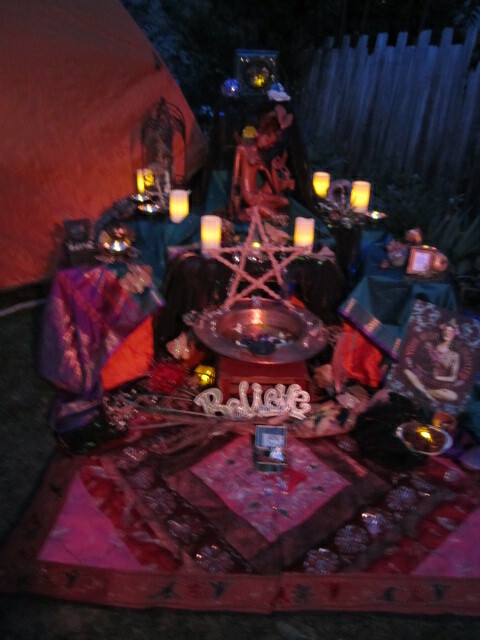 The entire altar is an embodiment of that energy, much like our bodies are to our soul. 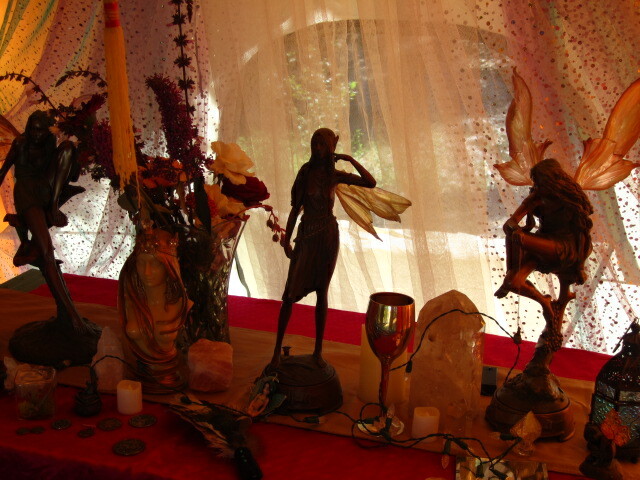 Yes, we have different pieces that are physical items, but when we are manifesting an altar those are the pieces that spirit is telling us it needs in order to grow in its full form. Sometimes those pieces are from nature, like flowers and crystals, and sometimes they are a statue of an actual goddess. Each piece has an intension and meaning behind it. They serve as the symbols that tell the story. 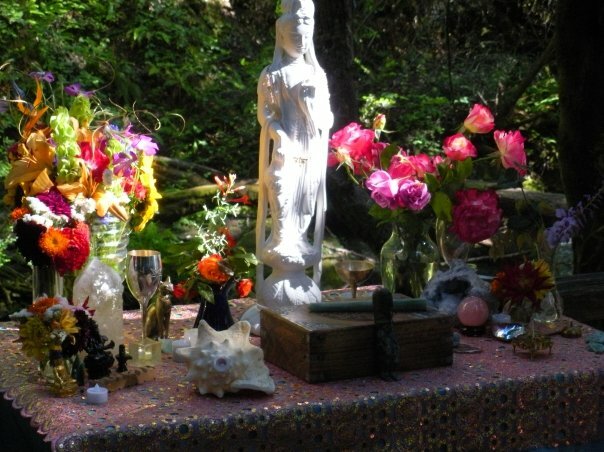 Anne and I have created many altars and sacred spaces over the years. Too many to even count! In the beginning they were simple. In fact my very first one had a black velvet cloth, incense for the air/east, a crystal and flowers for earth/north, a chalice for water/west, a wand for fire/south, and in the center I placed a candle that I would light for spirit. This was at the very beginning of my occult studies. I was building the foundation by learning the basics and identifying items to represent each of the elements. 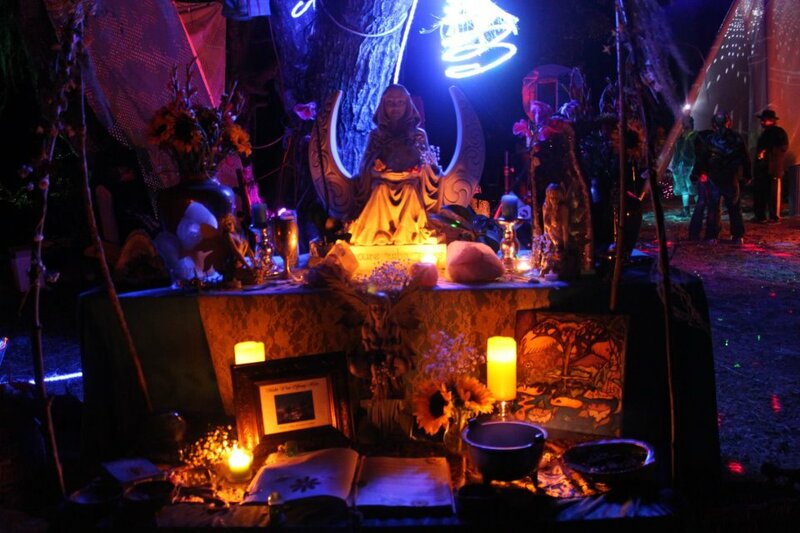 As I grew stronger in my foundation and more confident in my path I began to experiment by creating altars out of items I might not have considered before because I could see the symbolism in them. Then Anne and I started working together, and the beauty that seemed to manifest through us together took on a whole other form. 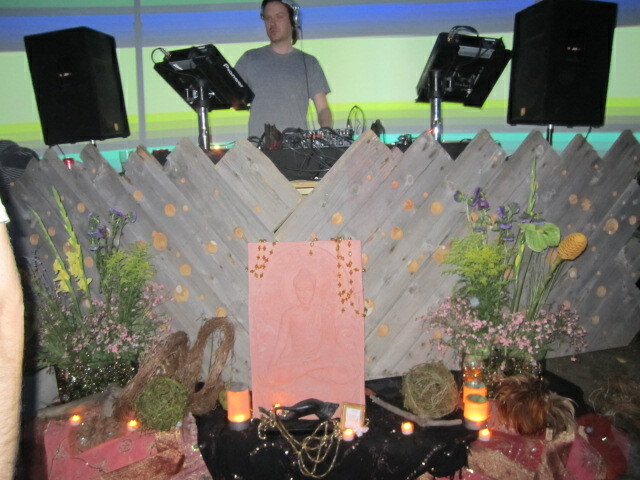 The more we worked together the more we learned to allow our altars to evolve into their own manifestation. It went from placing things on, sometimes way too many things, to really understanding the energy that was moving through us and what it wanted to become. For the bigger ones we create we usually start with a vision or theme. Typically it’s sent to us in some type of message; often in a dream. Sometimes it’s based on a deity, other times we focus on a particular faith or type of magic. Then everything seems to fall into place after that with the items that are selected to create it. Some of them we look for months just trying to find the right piece, some we design ourselves, other times the piece we need manifests right in front of our eyes as we are building the altar. For the smaller at home ones, we seem to focus on the deity and add items around its statue. 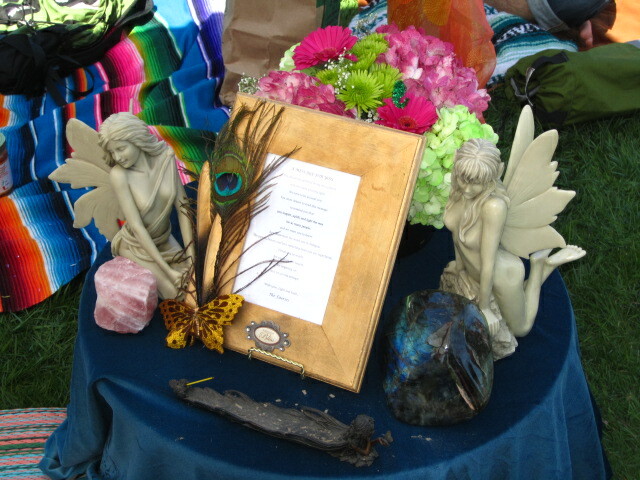 If it’s a more personal altar, one with an intension of something we want to invoke into our lives we find items of a personal nature, add symbols that represent that, and also add affirmations. 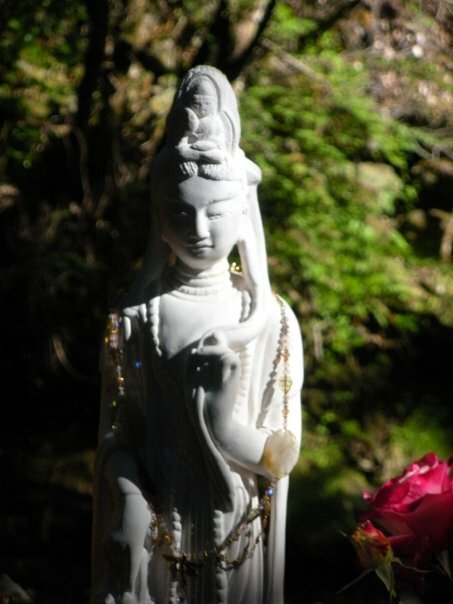 For example, if I felt like I needed to develop more compassion I would put Kwan Yin [the female Buddha] in the center, and surround her in rose quartz. I would also add white flowers, white candles, and write affirmations for myself about being compassionate. 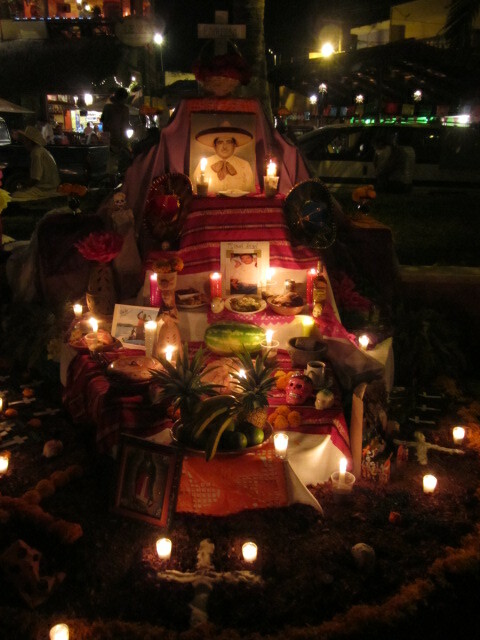 An altar doesn’t have to have such a specific intension as that though. It could simply just be a representation of your connection to spirit and whatever items you feel drawn to the most to represent that. That way when you take the time out of your day to focus on it you can connect with the energy. 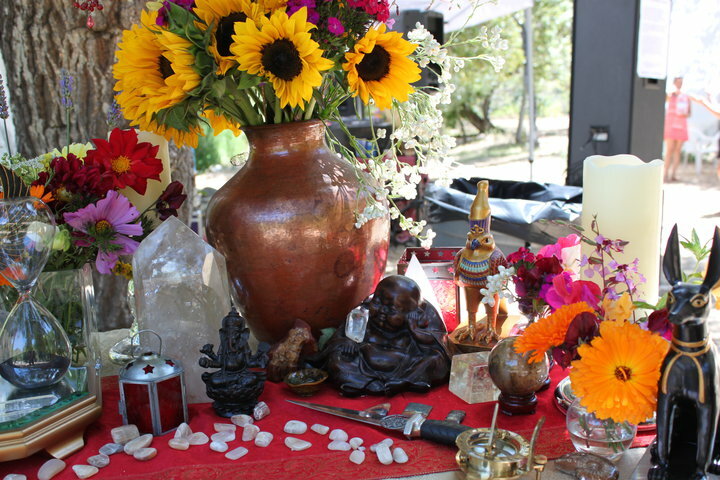 If you are interested in building your own altar, and aren’t sure where to start, here are a few basic steps you can follow to get into consciousness. 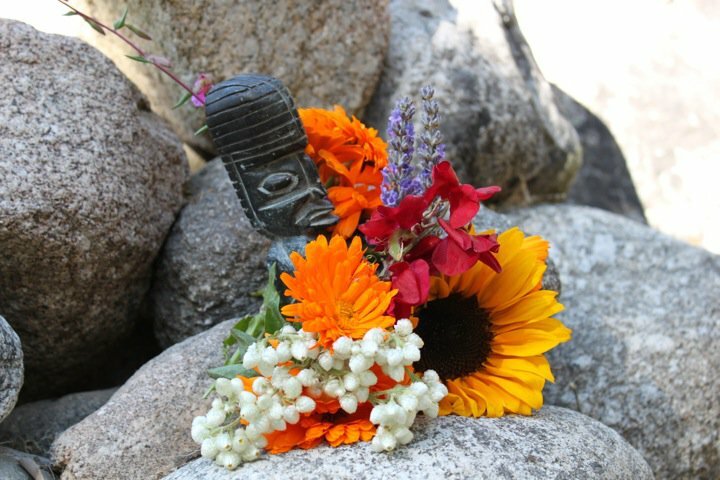 • Find a place in your home or yard that you feel has calm soothing energy. Try not to put it in a place where others might want to put things on it. 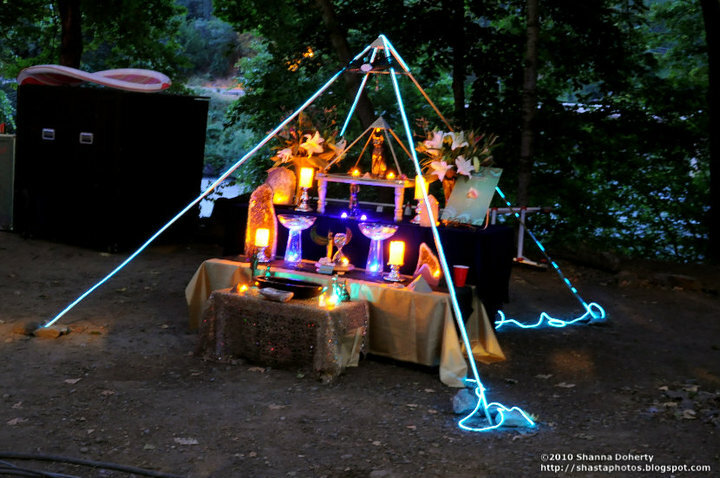 People can often be somewhat unconscious of your altar and unknowingly put things on it that carry their energy like keys, drinks, etc. 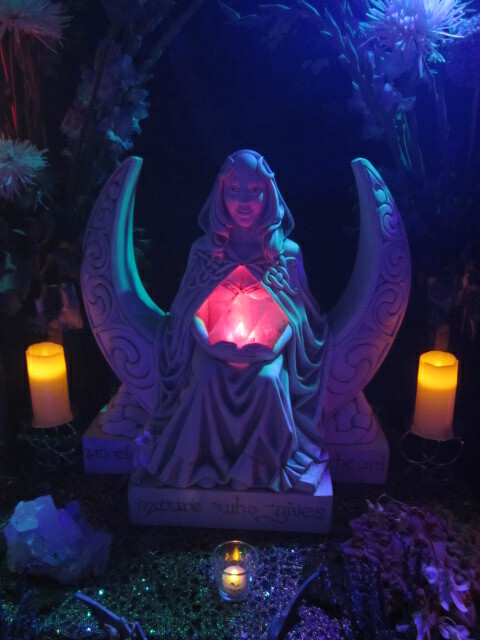 • You might want to even consider putting a small one in your entranceway, but this typically is best if its an additional one to your main altar. 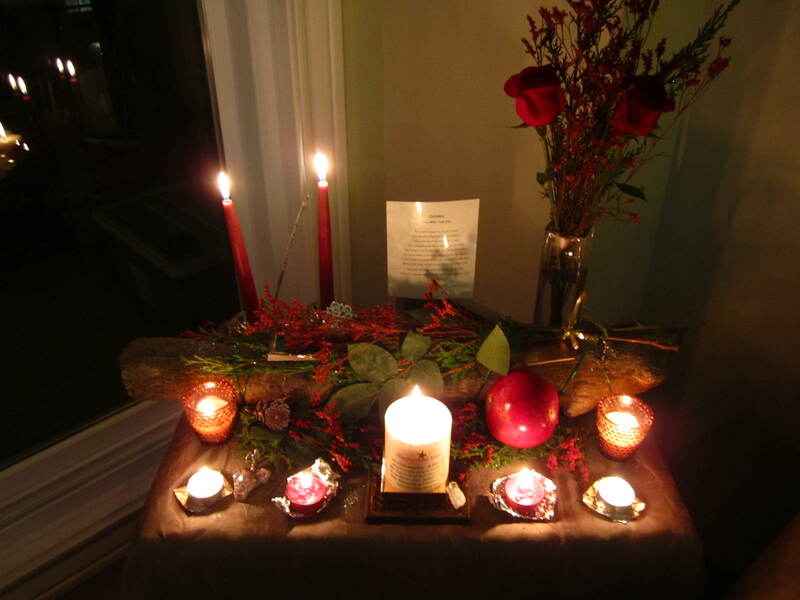 I find this type of altar best serves as a simple symbol to whomever enters your home that you are entering into a sacred space; your sacred space. • Cleanse the energy. 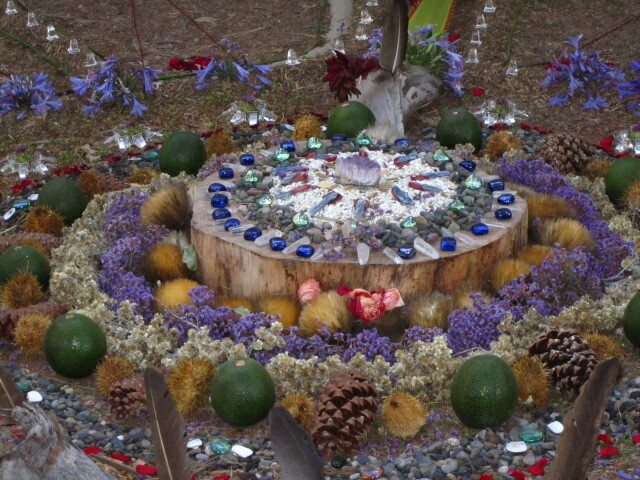 Burn a small amount of white sage over your altar. Or if you can find some Palo Santo wood it’s a wonderful tool for cleansing and purifying. It has been used since ancient times by the Incas and the scent is divine. • If you have a nice enough table top or shelf you can simply put your items on it. Anne and I like to use really beautiful material. 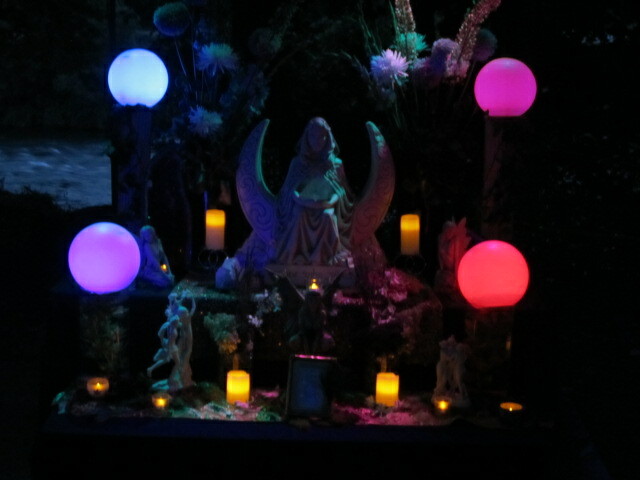 We buy it specifically with the altar in mind; everything from color, to the type of material. • Now light some incense or if you are adverse to smoke then use a burner and light some oils. Frankincense is great to use when building altars. It’s the one we typically use. 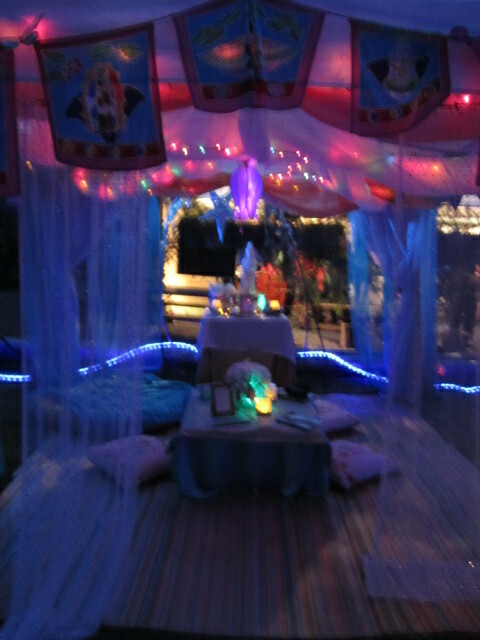 Although we’ve used everything from Nag Champa to Rose Cross. Whatever scent you feel drawn to the most is the best one to use. You could even just continue using the sage or Palo Santo. • You’re ready! Stay centered, remember to breath and listen to the quiet voice within. Let spirit guide you to design the rest. 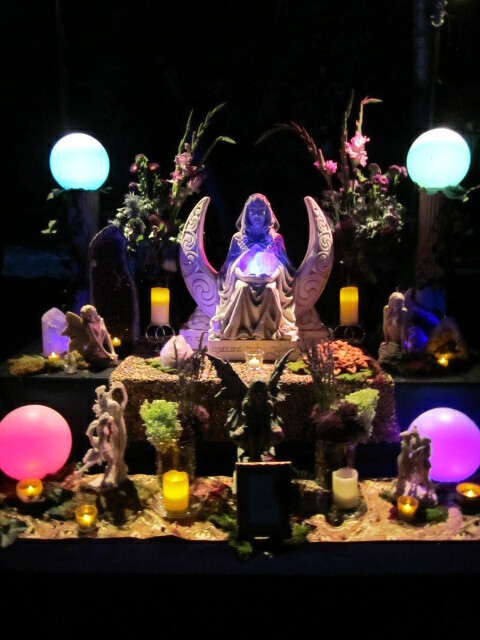 Here are some images of altars Anne and I have designed over time, along with others we have encountered along our path. We hope they inspire you. 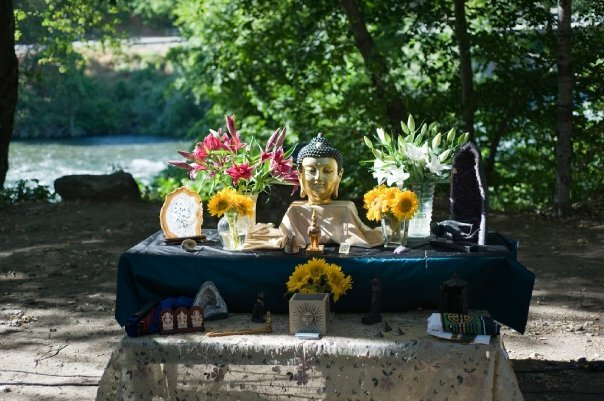 This entry was posted in Altars & Sacred Spaces and tagged altars, faeries, goddess, how to, incense, kwan yin, magick, Mother Earth, occult, palo santo, Sacred, spirituality, symbolism.